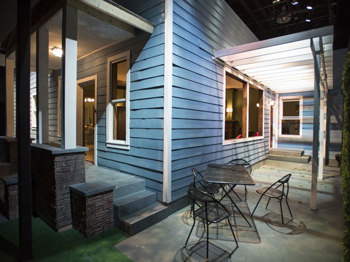 In order to vacate its storefront in the Irving Park neighborhood to make room for the long-delayed second half of their "2018" season, the company looked for an annex to their mainstage-not just any black-box studio, either, but square footage sufficient to accommodate a three-dimensional, fully-furnished five-room house with porch and patio, through whose doors an eight-member cast and thirty theater patrons stroll for ninety minutes. You heard that correctly—"theater patrons." Leslie Liataud's ensemble-based play employs "immersive staging," a narrative device mandating actors and audience physically occupying the same dramatic universe—in this case, a suburb in the American South, circa 1961, where family and friends have gathered to celebrate the birthday of an aging belle who is not alone in concealing dark secrets. As the revelations unfold in real time, the "party guests" represented by us, the playgoers, are encouraged to share the refreshments and move from the site of one crisis after the other, observing (but not impeding) the progress of the mayhem. The search for a spare room of the aforementioned capabilities led Artistic Director Amy Rubenstein to the burgeoning South Loop district. On the heels of a real estate boom spurred by the proximity of the UIC campus and McCormick Place Convention Center, a former Haynes Auto showroom on the historic "Motor Row" strip was secured. Relocating from the residential north-side neighborhood to a post-industrial jungle of former factories wasn't just a matter of reassembling scenery, however: auditoriums tucked into larger facilities often ask patrons to traverse long corridors in search of ticket offices, and while it may be summer onstage in gulf-coast Georgia, it's winter outside in Chicago. 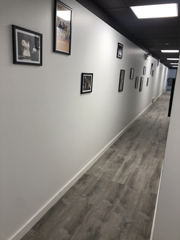 "Windy City Playhouse South is located on Michigan Avenue at Cermak, just two blocks west of McCormick Place" says Rubenstein, "The ambience is a bit more urban than our flagship on Irving Park Road, but we're just as committed to making our visitors comfortable. Once they're inside the theater, we have coat racks and lockers where they can store their outdoor attire safely, have a drink at the bar just inside the performance space or take the elevator to the restrooms, before exploring the play's environment, free of snowy boots, puffer jackets or other encumbrances." "For theatergoers who drive, there's metered parking on Michigan Avenue, free parking on the side streets and a lot with valets next door," Managing Director Evelyn Jacoby adds, "The Green and Red line Els stop nearby, along with buses from the Loop. Guests at the convention center Marriott, Hyatt or Hilton hotels can take a taxi—or even walk—to our doors." Actors are instructed to imagine an offstage prelude to their characters' entrances—a practice illustrating the importance of the route by which an audience arrives at its appointed destination in determining how readily they join in the illusion the artists strive to create. By providing its audiences a "transition" zone from the reality of the modern cityscape to a nostalgia-infused fantasy, Windy City Playhouse's extension of its "Southern hospitality" to the furthermost boundaries of its physical space prepares audiences from the very outset for the fourth wall-breaking experience contributing to Southern Gothic's seemingly endless run. Southern Gothic continues at Windy City Playhouse South in an open run.